Comic fans of all ages can jump up, up and away with this licensed, medium Superman jump from Ninja Jump. Superman is breaking through walls in the spectacular artwork, with his cape blowing in the wind, the Man of Steel's "S" logo above, and the great city of Metropolis below, participants can jump to their heart's content with America's favorite super hero. Superman's signature blue and red theme, and more "S" logos flanking the top of each medium bounce house, this jump will bring the soon-to-be super heroes running! 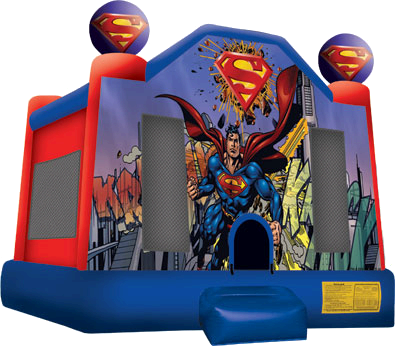 The Superman medium bounce house is part of an entire line of licensed Superman jumps and combos, including a more spacious large-sized jump.